Open the History window by selecting View > Windows > History. Preview what a workspace looked like when a specific edit was made: Mouse-over an entry in the table to see the preview. Revert the state of a workspace to a particular edit: Mouse-over the edit to that you want to revert and double-click it. The workspace reverts to the state of that edit. Edits that were made subsequent to the reverted state are still maintained in the table, so you can always revert back to a later edit. 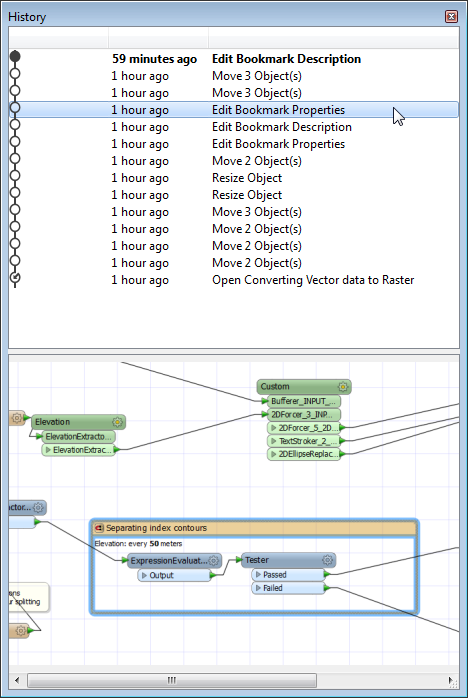 Further edits are recorded in a parallel node, creating a tree structure of edits, to which you can also view and revert. The example below shows all edits made to a workspace over the space of one hour. The bold entry reflects the current state of the workspace. To step through entries one at a time, use the Undo and Redo tools. Note: This does not produce a preview: the workspace reverts to the selected edit directly on the canvas. Saving the workspace does not affect the entries in the History Window, as long as the workspace remains open.